[SatNews] Due to satellite failure, the orbital incline of the Express-AM1 satellite has been impossible to maintain... this has been the case of as April 24, 2010. 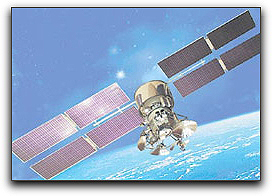 The Express-AM1 satellite was delivered to GEO 40 East on October 30, 2004. The satellite was developed on order of the Russian Satellite Communications Company (RSCC) by NPO Prykladnaya Mechanica, named after Academician Reshetnev (today ISS Reshetnev), together with the Japanese company NEC/TOSHIBA Space Systems. The satellite carries 9 transponders in C-band (40 MHz), 18 transponders in Ku-band (54 MHz) and 1 transponder in L-band (0.5 MHz). The satellite's operational design called for a life-time on GEO of 10 years, with station keeping accuracy +/- 0.05 (N&S/E&W). The Express-AM1 satellite is designed to provide multiservice package, digital TV, telephony, video-conferencing, data transfer, Internet access, mobile communications as well as to establish VSAT networks with a footprint that covers the European part of Russia, CIS, Europe, North Africa, the Middle East and India.